Scottish #Toryfightback on the cards? Have a look at the charts above. They don’t indicate a political earthqauke, like is predicted in Wales, but there is some shifting of tectonic plates suggested. 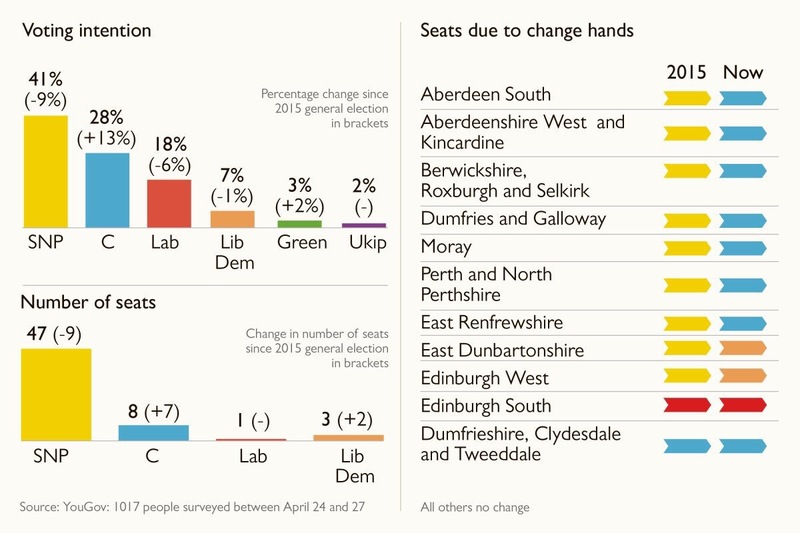 This is not just because the SNP could get quite a few less seats than they got at the 2015 election, but who is replacing them. At the moment there are more Giant Pandas in Scotland than Conservative MPs. The reason it could change provides us with yet another layer in this fascinating and unpredictable election. The figures first: The SNP are projected to fall from 50% to 41% of the vote, Labour, which had dominated Scottish politics for 50 years, may go down to 18%. The Conservatives are up by 13% to 28%. Now, as you may know, it is possible this won’t lead to any extra seats, as this uptick in votes needs to be geographically concentrated. Luckily for the Conservatives, in the South of Scotland, and around Edinburgh and Aberdeen, they do have some concentration. So the second chart predicts they could add up to seven seats. Why is this happening? Well, the biggest issue in Scotland at the moment isn’t Brexit, it’s the second Scottish Independence Referendum, which was legislated for by SNP leader and Scottish Assembly First Minister Nicola Sturgeon in March. Sturgeon taunted Theresa May at the time, reminding the PM she has no mandate to deny or delay the referendum. Bluff called. May might get that mandate. Scotland, at this election, is going to be divided between Unionists and Nationalists. Sturgeon has tried to claim that if nothing happens to the SNP’s seats then that is conclusive proof Scotland wants a second referendum. Unionists know that to stop or delay it in this election system (FPTP) they HAVE to coalesce behind one party. That Party is the Conservatives, mainly because they have a leader (Ruth Davidson) who is, for a Tory, astonishingly popular (even more so in some polls than Sturgeon). Labour is actually split on independence, the Conservatives are not. An interesting aside here is that even Nationalists, who might vote ‘Yes’ in a future second referendum, are wary of whether this is the right time for that referendum. They know that, like in Quebec, a second defeat ends the issue for at least a generation. SNP voters are not going to vote for other parties, but what they might do is not vote at all. which does let the Tories win some seats. It won’t be many seats, but it may be enough to send the SNP homeward, tae think again. « Change in popular votes but not seats in Northern Ireland?